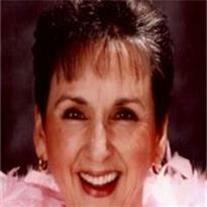 Brenda Flowers passed away peacefully September 30, 2012 in Queen Creek, Arizona. Brenda was born January 7, 1946 in Chinquapin, NC and led a life dedicated to the service of her family, her church and all those with whom she came into contact. Brenda always had a smile on her face and greeted everyone like a long lost friend. She is preceded in death by her father, Robert Franklin Maready, and survived by her husband of 47 years, Dwain Flowers, her daughter Pam and husband Tim Stufflebeam, daughter Kathy Flowers, son Joey and wife Marci Flowers and daughter Jackie and husband David Kennedy; grandchildren Jordan, Tyler, Tanner and Kaitlin Stufflebeam, Raechel, Jaren, Karli, Dawson and Jase Flowers, Kaden and Kaycie Kennedy; Mother Effie Maready, brother LeRoy and wife Ann Maready. A memorial service celebrating her life and legacy will be held Friday, Oct. 5, 2012 at 6PM at the LDS church building at 19413 S. Sossaman Rd. in Queen Creek. Arrangements by Bunker’s Garden Chapel.